Haynie's Lawn and Landscaping is full-service landscaping company that has been proudly serving the greater Tri-Cities area for more than 10 years. We work with you to create a unique landscape design that incorporates your ideas to enhance and compliment your property. Property Maintenance Annual programs consisting of regularly scheduled visits to keep your property looking its best and assess potential problems that may occur. This early detection of issues is just one of the many ways Haynie's Lawn and Landscaping partners with our customers to insure that their property is kept at it's peak visual performance. Accent your current landscaping or create a custom outdoor entertaining area, with a unique patio, an outdoor fireplace, or an outdoor cooking area with a built in grill. Let our team of certified and experienced installers bring your ideas to reality. 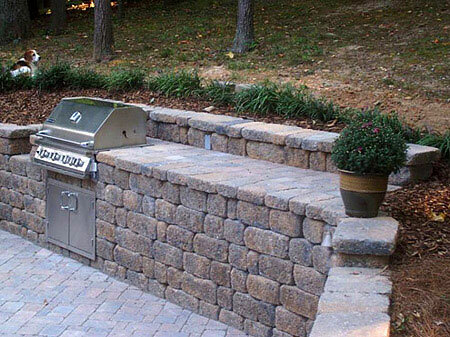 Accent your current landscaping or create a custom outdoor entertaining area, with a unique patio, an outdoor fireplace, or an outdoor cooking area with a built in grill. Let our team of certified and experienced installers bring your ideas to reality.